This post has little tutorial because they lack many passages difficult to explain when the model is complex to implement and especially because everyone has their own technique, but may give you some ideas. 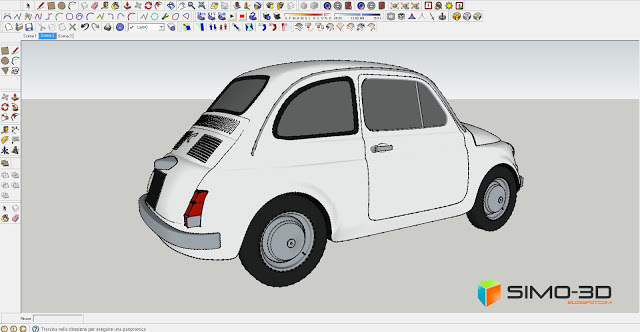 First I tried a good image in the network blueprint, after uploading it to Sketchup and designed the contours of the body, I started to model starting from the front wheel arches. Personally I like a lot of eye shape and helped with some photos found on the net. After finishing the bodywork I used the plugin “Subdivide and Smooth” and to round it to check for any inaccuracy. At this point I began to shape the bonnet then I created all around a rim bent inwards to give it thickness , in this way, when it is placed on the body , the effect is better. It ‘s time the bonnet and the parts that compose it. Missing doors that I modeled roughly on the inside. and the bumper with headlights and the Fiat logo in the center. This is the floor with the wheels and the rear seat. Even in this case, the rear seat is quite approximate because that is what you should see less then it is useless to burden the model. But this car without seats and steering wheel does not go anywhere! 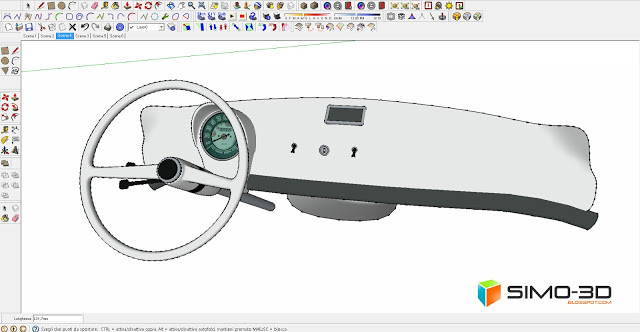 So taking a cue from other photos found on the net I started modeling the steering wheel, odometer and instrument panel complete with ashtrays and buttons. Even in this case, to round off, I used the plugin “Subdivide and smooth”. 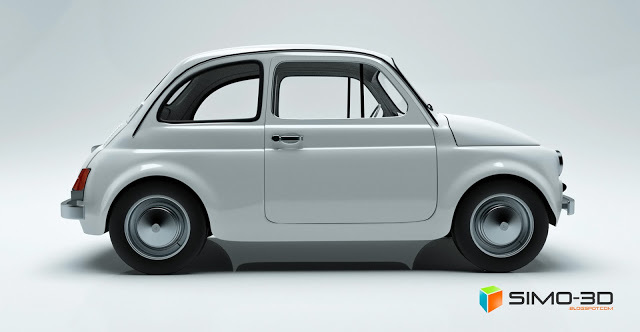 my Fiat 500 … it’s over! Security is often an integral part of the design process of new buildings – and an important consideration especially in large buildings such as airport terminals, or office complexes. Video surveillance cameras are used to monitor key areas such as entrances or high security zones, but it is important to understand where exactly to place them and what technical specifications are required to achieve optimal coverage. Installation of the surveillance systems also needs to meet the expectation of the end users. What can be seen and how will the different scenes look like when viewed through the eyes of a camera are some the basic questions to ask in order to help clients understand both the capabilities and limitations of different features, or systems in general. A well-functioning system that does not meet customers’ expectation is not going to inspire clients’ confidence in future projects. Deciding on the number, type and position of video surveillance cameras needed has traditionally required complex and time-consuming manual calculations. 3D visualization now makes the system designers’ lives much easier and helps them do their job more cost-efficiently and accurately: New tools are available that integrates with popular CAD software and assist designers with the planning and layout of complete video surveillance systems. Axis Communications, a leader in network video, is one company that offers a range of free tools that integrate with Autodesk Revit, SketchUp and Microsoft Visio – some of the most popular design software solutions that are widely used in architectural planning, building layout and system design. Available for download from the Internet as an addition to the CAD software, and with camera models available for import into CAD drawings; tools like these help designers decide on the ideal position for each camera by simulating camera coverage based on the camera’s field of view and required resolution. 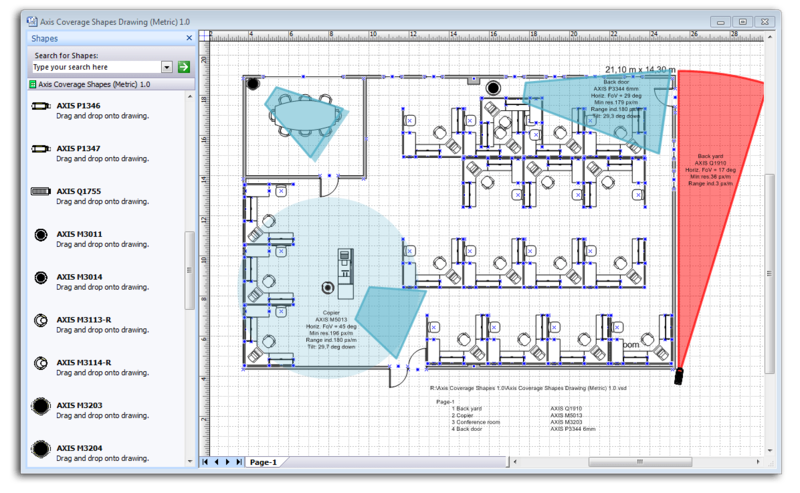 Axis Coverage Shapes for Microsoft Visio helps security system designers decide on the ideal position for each camera by simulating camera coverage based on camera field of view and required resolution. Designers can import existing drawings and building layouts or uses the software to draw up the layout of the area they need covered by video surveillance, and then use a simple drag-and-drop function to choose and place cameras directly into the building drawing plans. Realistic, interactive 3D camera models in Autodesk Revit and SketchUp illustrate what the camera set-up will look like in real life, how the cameras integrate with their surroundings, and which area the video surveillance system will cover once installed. Users can choose from a large range of cameras and mounts and place them on any surface in the building plan. Once placed in the design, the software shows the camera’s entire field of view as a colored area, with a resolution guide that helps determine the area where the target image solution is met. To achieve the best coverage with the video surveillance system and optimize the system layout, the software allows designers to try out and compare different camera models, mounting positions and view angles. The software includes controls so users can specify values such as the required focal length, target resolution and mounting height. Users can interactively move the cameras by dragging them to different mounting points and pan or tilt them to determine the camera’s field of view for various setups. One feature uniquely available for Autodesk Revit and SketchUp is a camera view feature that lets users switch to 3D views as seen from the security camera’s point of view, and look through the lens of the camera literally at the click of a button. 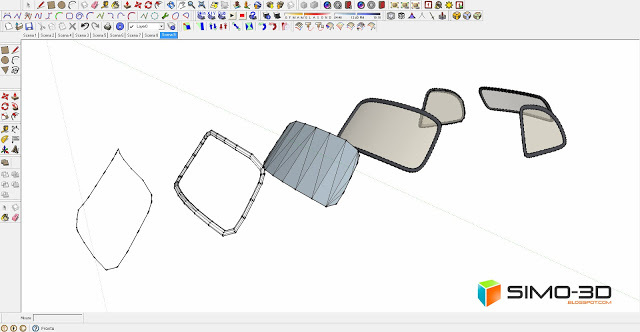 In SketchUp, this view, the camera can also be rotated or its angle adjusted and the user can see how this changes the field of view from the camera. This allows designers to get a good impression of what the final video surveillance scene will look like at an early stage in the design project, and identify any objects that might obstruct the camera’s field of view such as columns or walls. Once all cameras have been placed in the building design, it is then easy to verify the coverage area for the entire video surveillance solution. These images/scenes can also be used talking to the end user in regards to the systems’ functionality, and help out setting the correct expectations which can then be achieved by the system once installed. Axis Camera Families for Autodesk Revit offers detailed metadata required for Building Information Modeling (BIM) and allows security system designers to interactively visualize camera coverage. 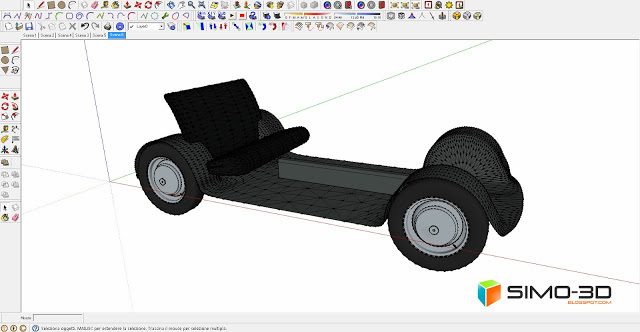 SketchUp is a popular and readily accessible 3D CAD software that is particularly easy to use, while Autodesk Revit offers some more advanced and powerful design features that are useful especially in larger design and building projects. To make full use of those, the camera models for Autodesk Revit include detailed metadata required for Building Information Modeling (BIM), a process involving the generation and management of digital representations of physical and functional characteristics of places. They are files which can be exchanged or networked to support decision-making about a place. From inside the CAD drawing, users can access information about each camera such as the model number, focal range, resolution, mounting options and mounting accessories available, as well as power consumption. Once the design is complete, a camera summary lists all cameras used in the design, including any mounting accessories required for the installation. There are a number of benefits in using 3D visualization tools when designing video surveillance systems. The most obvious benefit is how 3D visualization helps with camera selection and placement. With these tools, system designers have easy access to a complete range of different cameras directly inside the software, including links to relevant technical specifications. By dragging and dropping the cameras in the CAD design and moving them around, they can see what each camera looks like in its environment from a design perspective, and view the camera’s coverage for all the different camera types and possible mounting points. This allows them to decide which camera is best suited for the scene that needs to be monitored, and where it should be positioned. 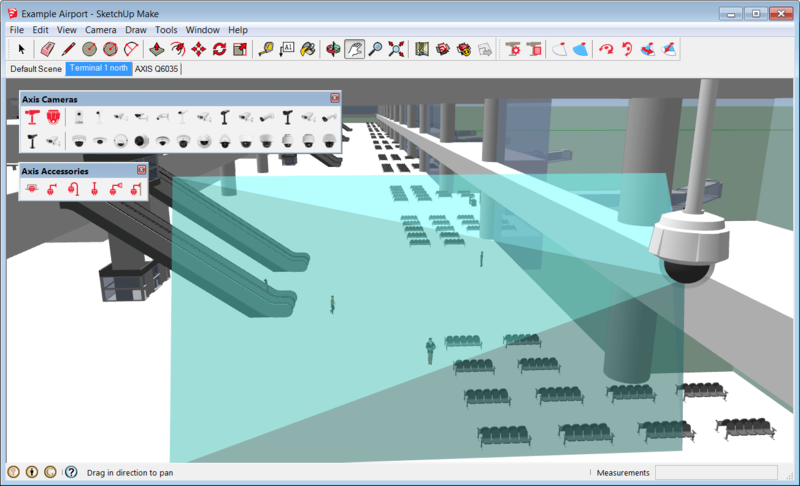 3D visualization tools also help system designers to determine and meet the operational requirements for each video surveillance camera, such as ensuring that the camera has enough resolution, expressed in pixels per foot or per meter to identify a person entering a building through a particular doorway, or to be able to apply intelligent video analytics. With an image resolution guide, the tools provide clear guidance on the image quality that can be expected from each camera in the given setup, and they clearly show the area in the camera’s field of view where the required target resolution will be achieved. By exploring using different cameras and mounting options for the video surveillance solution, system designers can make sure that the finished and installed system will not only cover the right areas in or outside the building, but also deliver the required image quality. With Axis Camera Extension for SketchUp, security system designers can evaluate how cameras fit into the building layout and easily spot if the camera view coverage is obstructed by columns or walls. 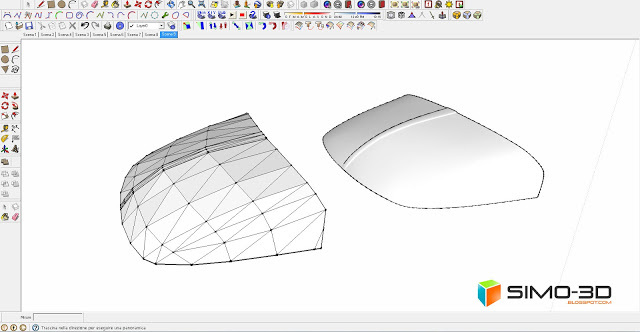 Autodesk Revit and SketchUp both include advanced features that let users simulate the movement of the sun throughout the year, and Autodesk Revit can even simulate foliage growth on nearby trees and shrubs. Both are important in understanding the light conditions in which each camera will operate. For example, in winter the sun might be so low that it shines into a camera’s lens through a window, or foliage might be so dense in summer that an area in the building becomes very dark or the view from a camera might become obstructed. In both cases, simulating and visualizing the setup will help the system designer decide whether a camera needs to be moved, or a different camera chosen that can cope with difficult light conditions. Finally, 3D visualization tools are a useful aid for system designers in setting the right expectations with their clients. By demonstrating exactly what the installed system will look like, what it will cover and what camera views to expect, clients will be able to understand the capabilities and limits of the system. The installation and approval process can be streamlined and the list of issues that will need to be fixed before a project can be signed off can be significantly reduced. To achieve the best level of security and avoid blind spots that could potentially become a security issue, security systems need to be planned at the same time as other essential services such as electrics and plumbing. With an integrated video surveillance system planning tool, designers can see exactly how the cameras fit into the building layout and can easily detect if views are obstructed by columns or walls, or if the camera installation conflicts with any other building systems such as mechanical, electrical and plumbing installations. This helps to manage customers’ expectations when potential issues can be identified and tackled as early as possible. With interactive 3D visualization tools like these, architects, engineers and system designers can improve planning and work more efficiently. The result is more effective value engineering, device placement, conflict identification and aesthetic coordination. 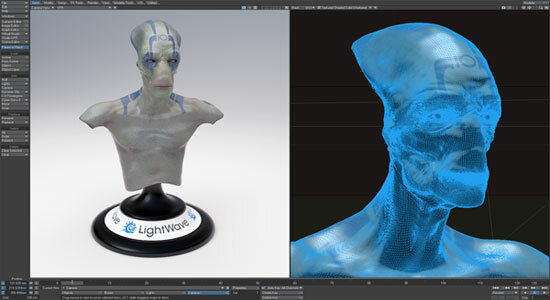 The LightWave 3D Group, a division of NewTek, Inc., has made available the final release of LightWave 11.6 software for 3D modeling, animation, and rendering. In addition, the company announced today the final release of the NevronMotion plug-in for LightWave 11.6, which uses the Microsoft Kinect camera to capture motion in real time for retargeting to 3D or live-performance characters. NevronMotion also simplifies retargeting data from standard motion capture files directly into the LightWave interface. LightWave 11.6 is priced at $1,495 and the NevronMotion plug-in is priced at $299. Registered LightWave 11 customers can upgrade to LightWave 11.6 free of charge; upgrade pricing from LightWave 10 or earlier versions is $695. Educational pricing is also available. I recently created a blog post about visualizing a repurposed alley in Boulder, Colorado using quickly generated hand drawings. That effort evolved into a more detailed exploration of the alley improvements in the format of a presentation SketchUp model. This colllection of images show how I constructed the SketchUp model which revealed a series of alternative alley uses, shadow studies and eye-level views. I learned from this exercise that there are design projects that may not require any drawings to communicate their basic concepts and that a well crafted SketchUp model may be more than adequate to convey your big idea. Repurposed Alleys. 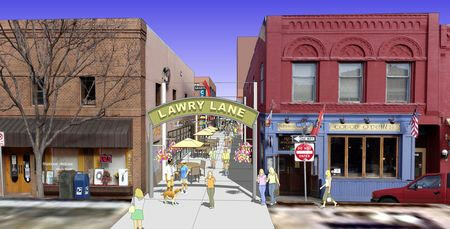 Many downtown service alleys are being converted to commercial uses such as restaurants, concert venues and special events. 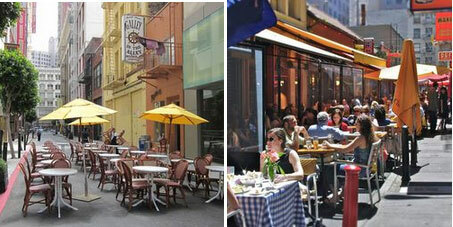 These photos are from two alleys in San Francisco that were transformed into outdoor dining spaces during certain hours of the day and then converted back to their original service use all other times. These were the inspiration for how I approached building the SketchUp model (below). Base SketchUp Model I call this type of SketchUp model a “stage set model” for it is constructed with no more than a series of empty shapes with photographic facades applies to each face. I photographed all of the existing buildings and applied them to specific faces of the model. 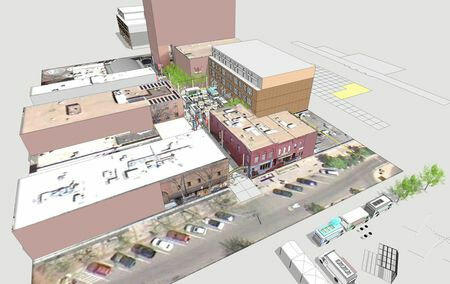 The resulting 3D SketchUp model was accurate enough to convey the existing neighborhood condition and spaces between buildings. The base image (streets and sidewalks) was saved from Google Earth. Strategic Model Views. 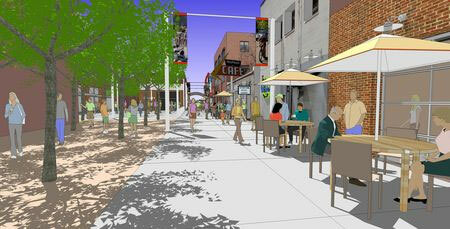 You can see from these two views that there is a large open space in the central portion of the alley. 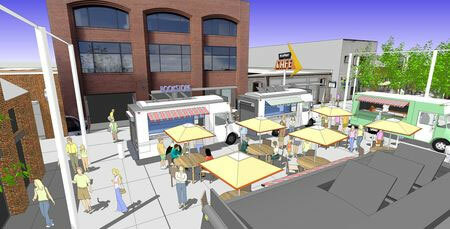 I developed several different design scenarios using that space as an outdoor food court with food trucks (shown) or as an art fair with tents, or even as an outdoor movie theater. Each alternative was saved on a different layer in the model. I then established a series of more than 10 model scenes (views) that showed the alley from above and at eye level. Those views were very helpful for studying and documenting how the sun cast shadows at different times of the day and season. Alley Entrance Signage. This view angle of the Lawry Lane alley entrance was established as if I were observing from a second floor window across the street. The building facades are from digital photographs I took during a site visit. I constructed the sign, furniture and populated the model with a mix of 2D and 3D people, plants and other elements to establish the character of the alley space. Alley SketchUp Entourage. Look carefully at the many different elements that have been placed into the basic alley model. I added 3D sign letters to the building facade, decorative “buttons” on the glass storefront, 3D and 2D people, custom umbrellas with red banding, and regularly spaced poles with banners. I added the red colored stripe on the banners to coordinate with the umbrellas and inserted images of bicycle racers that I photographed at a local competition. 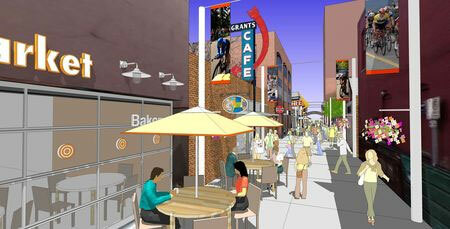 I fabricated the Grants Cafe sign from an image I downloaded from the internet and made into a SketchUp component. Central Food Court. 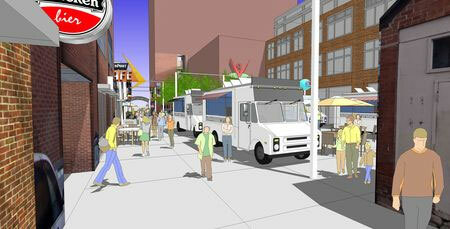 I created a scene with several food trucks (downloaded from SketchUp 3D Warehouse) surrounding an outdoor seating area with shade umbrellas. 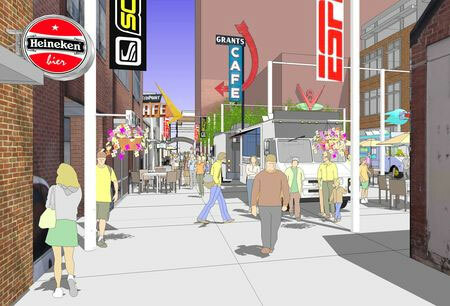 This important urban space adjacent to the alley was developed with three different design options: food court, arts festival and outdoor movie theater. I exported jpegs of the three options from these two overhead and eye-level views. Strategically Placed Shade. This scene included a small pocket park adjacent to the alley planted with shade tress. I positioned the sun angle in such a way to cast tree shadows across the alley surface. Those shadows in combination with the umbrella shadows enhanced the setting. If I had more time to invest in the model detail, I would have added some elements to the table surfaces and seating in the pocket park. Flower pots and additional landscaping in the park would have also been worth adding to the model. Night Movie Scene. 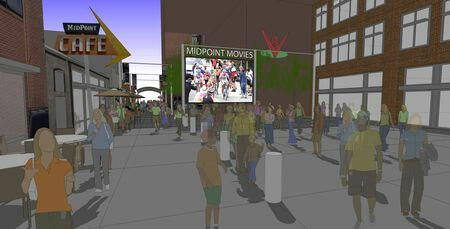 This outdoor movie theater scene wasn’t easy to create alone in SketchUp. I established the basic view and then added the bike race photograph and a dark gray overlay in Adobe Photoshop. Given more time, I could have created a more successful night time effect using other graphic alternatives. I don’t think this scene was very convincing – especially when you see hard shadows beneath each individual! I’m currently working on a variation on L & J. G. Stickley’s No. 220 prairie settle. The settle’s three sides consist of frame and panels. Because I’m building a shorter version, I need to shorten the rails and resize the panels. Before SketchUp, I would have subtracted the combined width of the stiles from the rails, divided that number by the number of panels and added twice the overlap of stile and rail to calculate final panel width. Using the SketchUp Copy command, I can avoid the math and distribute the necessary number of stiles along a rail automatically (this even distribution of objects along a line is also known as a linear array). I begin by selecting the component I want to distribute by clicking on it with the Select tool. I activate the Move tool (I use the keyboard shortcut M) and hit the Alt key (Windows) or Option key (Mac) to activate Copy. A plus sign appears at the upper right of the Move pointer to indicate Copy is active. I click on the lower corner of the component and move it to its final location. I then type the number of times I want the component to be copied followed by / and hit the Enter/Return key (Windows/Mac). In this example, I want two instances of the stile to be distributed along the rail, so I type 2/ and hit Enter. Note how /2 appears in the measurement field of the window. My stiles are now properly distributed along the rail. To finish up the side, I can fill the frame with panels. 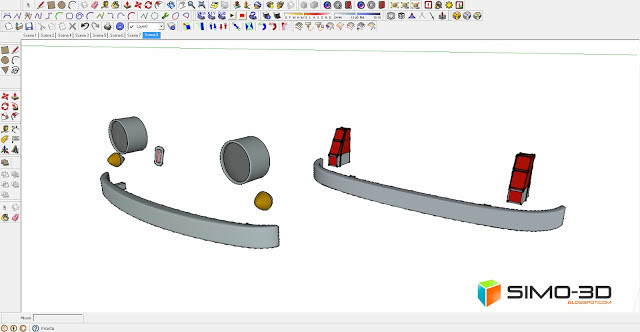 The teens in Brian Cohen’s math classes love to use SketchUp 8 for 3D modeling. They design their dream houses, then dive into the algebra and geometry problems their own imaginations create. OK, so what’s the surface area of the living room walls? How much would it cost to wallpaper them? How much air volume is there in the den? You have to know if you want to heat it. SketchUp 8 runs smoothly on any of the 33 refurbished ThinkPads, circa 2010, that Cohen raised funds to buy for his classroom. But woe to the student who takes that math work into the school’s computer lab, outfitted with Apple iMacs built when George W. Bush was in the White House – not so long ago in people years, but seriously aged in digi-time. On them, SketchUp 8 is too new to load. That’s just one small example of the challenges faced by Cohen and his students, and an illustration of the persistent disparities – the “digital divide” – that emerge yet again in a report due out Thursday from the Pew Internet and American Life Project. Even at Cohen’s school, an academic magnet so tuned to technology that its name – the Academy@Palumbo – looks like an e-mail address, talented students are weighed down by a lack of technological resources. And unlike their counterparts in schools such as Lower Merion High, where Cohen went, the academy’s largely low-income students aren’t likely to find better computers at home. Pew’s study is the latest in a series aimed at understanding how teens interact with a technology – the Internet – that in two decades has transformed their world. It looks at how their teachers use technology, both in and out of their classrooms. Project director Kristen Purcell says Pew did not set out to focus on the well-documented digital divide when it surveyed nearly 2,500 sixth- to 12th-grade teachers. It was hoping to learn how they use a range of technologies and see their students using them, and also see how technology affects the educational process. The divide leaped out anyway. Teachers of poorer kids were consistently less positive about technology’s role, less likely to say schools provided key resources and training, and more likely to say students lacked home computers with Internet access. In North and South Philadelphia, there is plenty of evidence of the problem – and of teachers fighting the tide. Cohen, who does double duty as his school’s technology coordinator, tries to promote Comcast’s Internet Essentials, a $10-a-month program for low-income families. At last public count in September, Comcast had signed a paltry 3,250 customers in the Philadelphia market, even though it estimates that 98,000 families qualify in Philadelphia alone. A spokesman says Comcast will be reporting additional progress next week, but declined to provide details. Cohen, 27, saw the other side of the gulf before leaving Lower Merion – a school that spends about twice as much per pupil as Philadelphia and provides every student with a laptop – for the University of Pennsylvania. Mary Beth Hertz, technology teacher at North Philadelphia’s Alliance for Progress Charter School, tries to get her kids going early. Kindergartners have technology class at least once a week. Fourth through eighth graders come to an iMac-outfitted lab about twice a week. Hertz, 32 and an Oberlin College grad, sees some students shine, such as a seventh grader who “taught himself how to program because he wanted to hack into his video games.” For this year’s Computer Fair, she’s mentoring five pupils creating things such as a website, an animation, and a graphic-design logo. Only one had access to a computer and the Internet at home, Hertz says – echoing a finding of the Pew study’s teachers, who said just 18 percent of students had access to all or nearly all the digital tools they needed at home. She says even affluent families face the problem that kids know more about being Web consumers – say, of Facebook – than about basics like file management. This SketchUp training course teaches you how to use this 3D modeling program designed for architects, engineers, designers. 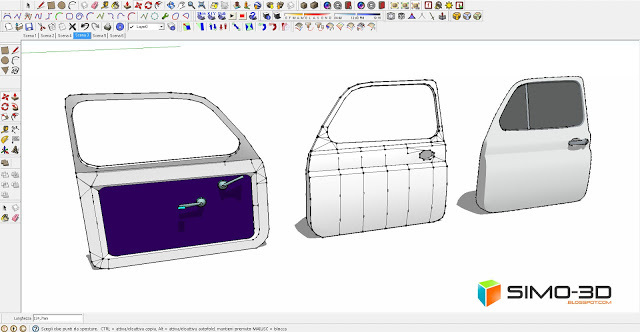 SketchUp comes in two versions, a free and paid version. This tutorial can be used with either version, and is designed for the absolute beginner. No prior experience with 3D modeling programs, or SketchUp specifically, is required. You will start by exploring the user interface for SketchUp, getting familiar and comfortable with navigating and where the tools are located. The course utilizes many Ruby scripts, which are provided in the working files, and he will show you how to install and use the scripts throughout the course. Some of the functions that you will be taught throughout this tutorial include; working with lines and shapes, how to make faces and surfaces, drawing edges, scaling your models, working with layers and using the architectural tools. You will also learn how to style your work, use color and texture on your models, create walkthrough animations and finally, how to export your work to share and present it. Imagination Technologies has just launched Visualizer for SketchUp. 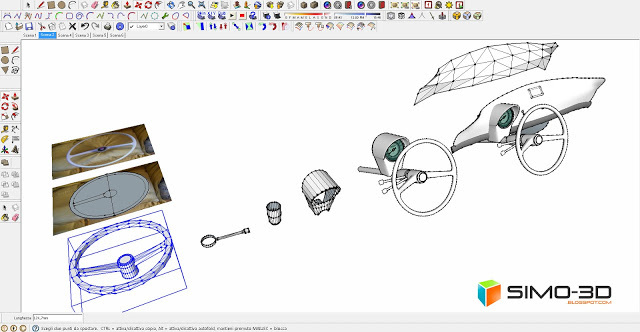 This latest sketchup program facilitates the users to snap real time virtual photos of their 3D designs in SketchUp(R) with a single click. The sketchup users can access Visualizer for SketchUp through getvisualizer.com. A free seven-day trial and a license version for $19.99 are available in getvisualizer.com. Visualizer for SketchUp can transform any sketchup model to a photographic version. Visualizer is similar to a smartphone camera inside SketchUp. With the progression of the work, the image in the Visualizer revises in real time and produces quick visual view for the design underway. After getting the satisfactory result, the users can apply shutter button to snap a quick picture and distribute with others, present to the client for demonstration, or have an idea regarding the quality of the design. By reproducing the pathways of light in 3D space precisely, users will be able to view shadows, delicate lighting details as well as focal depth and exposure of the virtual camera itself. 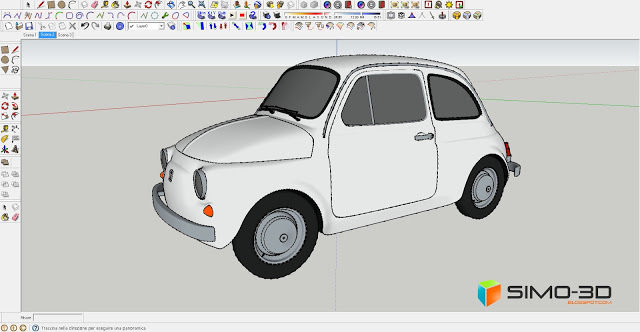 With the physical dimensions and geolocation information obtained from SketchUp, the resulting picture depicts how the photograph of the model will appear in real-life. Visualizer ascertains material properties directly from the information previously existed in the SketchUp model devoid of any modification. To manage focus and exposure, just draw an exposure and focus point just about the image and the picture revises in real-time. Visualizer for SketchUp applies Imagination’s highly powerful PowerVR Ray Tracing software for generating photorealistic images in real-time. Andrew Peel is organizing a live event on designPH, an exclusive sketchup plugin for PHPP. This course will be held on June 16, 2014 from 9am to 4:30pm in 505 Eighth Avenue at West 35th St, New York. The course will provide great benefits to architects, developers, self-builders, building energy modellers and other building professionals. designPH is useful to make the design procedure uncomplicated for getting the Passive House standard. The most updated plug-in for SketchUp contains a 3d modeling interface that is compatible with the Passive House Planning Package (PHPP). One can produce a building model, allot building components, and go for a location. A streamlined annual energy calculation offers a swift test of the design. After getting a submissive design, key building characteristics are exported for amalgamation into PHPP. By attending this one-day course, participants will get familiar with the application of designPH in support of the design and certification of Passive House buildings. Participants will be provided brief guidance throughout the building design progression, from formation of building model to exporting to PHPP. Special attention will be given on iterative design to obtain the Passive House criteria. There will be a case study containing practical experience in producing and documenting a designPH model for building certification. Generate a 3D model of a building. Establish prime building characteristics along with areas, volumes, and shading. 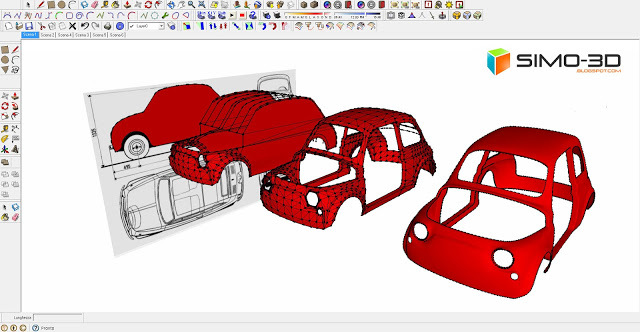 Know the usage of the designPH interface and how to access the components database. Allocate building components and performance data to the building model. Work out a simplified annual energy balance for the building. Be trained how to iteratively clarify the model to get the Passive House criteria. Export building characteristics and import them into PHPP. Acquire and document data and calculations for Passive House certification. To attend the event, one has to pay $295 that contains the cost of snacks & coffee. NYPH members can get a $25 reduction. Course Requirements: Laptop with PHPP v8.5, Google Sketchup 8, designPH v.1.0.0, and MS Excel (or equivalent), all preloaded. Reserve your seat for the course. 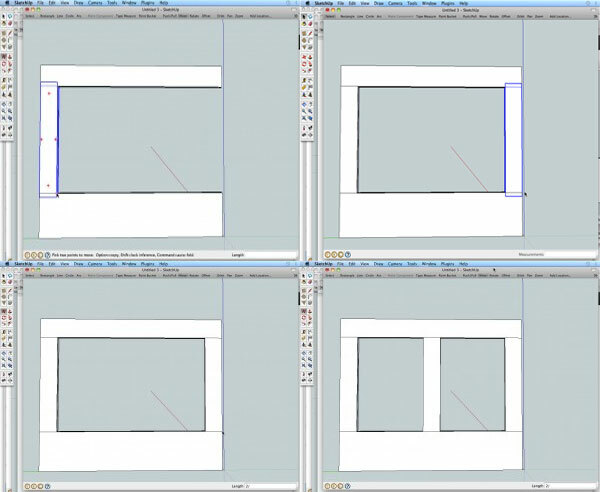 Aerilius has developed Toolbar Editor for sketchup. 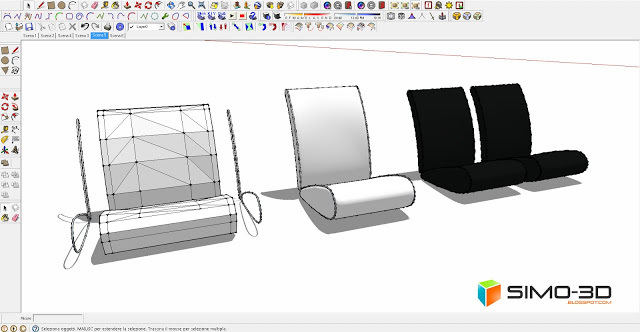 This sketchup extension is compatible with SketchUp 8, SketchUp 2013, SketchUp 2014. 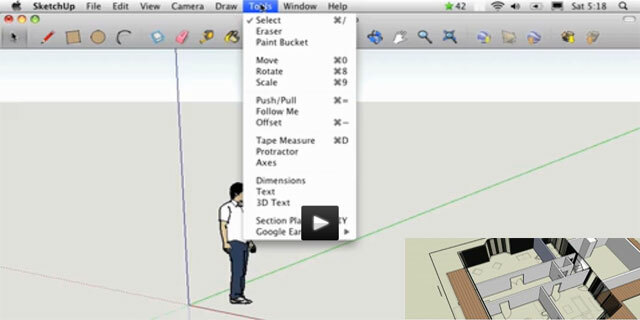 The plugin facilitates the sketchup users to make custom toolbars as well as buttons from any other plugin. The users can generate toolbars which have only buttons to be utilized in reality or integrate buttons from diverse plugins. The sketchup users will be able to rapidly include new button for ruby commands and valuable code snippets devoid of transforming code into a plugin on its own. Select the “+” button situated at left side to generate a new toolbar. The name of the toolbar can be edited and the toolbar (“-” button) can also be eliminated. Drag and drop items from the list of existing buttons to the left into a toolbar panel. The users will be capable of reorganizing the buttons, shifting them into other toolbars or taking out them by placing them out to the right. After making necessary modifications, press the apply button to save. 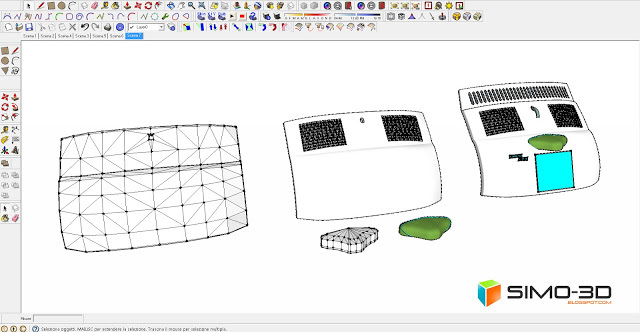 All modifications will not be reflected instantly, some only on next start of SketchUp. The users can sort out the list by providing some keys into the search field. Press the “+” button on the right for getting a new button. After that give your own Ruby commands or put on a piece of Ruby code that is available on the forums. The sketchup users can download it from the extension warehouse or sketchUcation forum.